With the administration of DAV College, Sector 10, struggling to maintain a normal atmosphere on the campus amid the ongoing tussle. 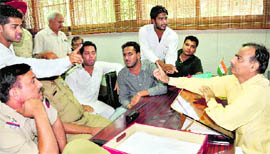 Student leaders argue with DAV College, Sector 10, principal BC Josan, in the college on Thursday. In a typical case of the district administration proposing and the Akali councillors disposing, an item regarding beautification of roundabouts. Holding Rajinder, Raj Kumar and Ajmer Kaur guilty in a dowry death case, the court of additional district & sessions judge Ved Prakash Sirohi today sentenced them to rigorous imprisonment for ten years. The court also imposed a fine of Rs 5,000 on each of the convicts. Digging deep into the Sukhna Lake conservation issue, the State of Haryana today informed the Punjab and Haryana High Court that the water level had dropped from 18 feet in 1958 to just about 4.5 feet this year; and the “alarming situation” warranted “certain management” practices. 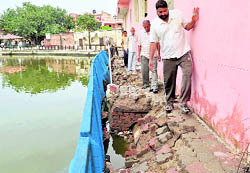 The failure of the Chandigarh Municipal Corporation to repair the storm water pipeline forced two Dadu Majra families to spend sleepless night yesterday following cracks in their houses. 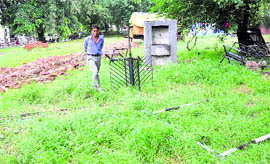 Green belts that have been developed in the City Beautiful are in a shambles owing to the lackadaisical attitude of the municipal corporation (MC) for maintaining the same. A classic example of this is the green belt in Sector 34 which has not been properly maintained by the authorities for the past one year. This green zone, instead of providing a whiff of fresh air to residents, has been converted into a garbage dump. The district police would soon have the live fingerprint scanner from the state police as it was facing problem of working without a forensic team, which would function from the premises of District Courts complex. A total of 98,088 children vaccinated during the pulse polio campaign held in the city from September 19 to 21. Private carrier JetLite will introduce daily flight from Chandigarh to Hyderabad via Delhi from October 1. According to Jet Airways sources, the JetLite flight would leave Delhi at 4.10 pm and reach Chandigarh at 4.55 pm. The Chandigarh administration today undertook to introduce air-conditioned buses for lawyers of the Punjab and Haryana High Court. The undertaking was a part of the administration’s endeavour to solve the parking problem on the High Court premises. The buses would ferry advocates to and from the High Court premises from different parts of the city. An unidentified man in his fifties was found dead in a rivulet behind the Sector 16 Cricket Stadium this morning. In another incident, the body of a vagabond was found near the local bus stand in Mani Majra. 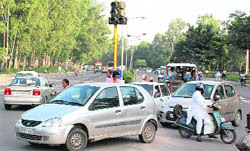 Often criticised for issuing challans rather than streamlining traffic, the UT SP (Traffic), HS Doon, has instructed his men to manually regulate traffic at busy intersection during peak hours. Chandigarh: UT Administrator Shivraj Patil has assured the Petroleum Natural Gas Regulatory Board that Chandigarh would provide all support for laying the gas distribution network in the city. 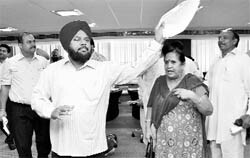 The Punjab department of Housing and Urban Development at a recent meeting chaired by Punjab Chief Minister Parkash Singh Badal has allowed the promoters of mega projects to execute certain development works by spending out of the External Development Charges (EDC) they are liable to pay to the government. Taking cognizance of the news report highlighted in these columns recently regarding violation of the Deputy Commissioner’s orders of parking vehicles along the highway, the local administration today constituted a five-member committee for carrying out inspection. Three ultrasound machines of the Fortis Hospital were sealed by officials of the Health Department, as some irregularities were allegedly found in the working of the department concerned. Dr PK Shridhar, Civil Surgeon, said a team led by Dr SP Surila, District Family Welfare Officer, had inspected the ultrasound centre of the hospital and found that the work was allegedly not being done in accordance with guidelines laid down under the PNDT Act. The hospital had failed to maintain a proper record of the patients who had gone in for the ultrasound examination. Residents of Sectors 23, 25, 26 and 27 took out a peace march to register their protest against the dumping of garbage in an open space in Sector 23, here, today. The residents after the march formed a joint action committee to highlight their problem. They had held protests earlier also and even caught hold of the people who were involved in dumping the garbage in the area illegally. A fire broke out in an office at Sector 67 last night damaging some of the items there. According to fire brigade officials, fire broke out in Sebi Square around 9 pm. In a unique initiative, the UT education department has come up with a plan to organise talent hunt for about 8,000 students studying in city-based Alternate Innovative Education centres. Commuters on National Highway -21 and 95 were a harassed lot today after the Bharatiya Kisan Union (Rajewal) faction blocked traffic for an hour from 2 pm to 3 pm. Ministry of Human Resource Development has taken an initiative to set up virtual labs to improve quality of technical education in India. MM Engineering College, Mullana, has been designated as nodal centre for the virtual labs for one year. A website in memory of former SGPC member jathedar Gurcharan Singh Tohra was launched today at a gurdwara, Fatehgarh Sahib. The website was launched in the presence of SGPC president Avtar Singh Makkar, jathedar of Sri Akal Takht Sahib Giani Gurbachan Singh and other Sikh religious leaders. Heavy rains in the northern parts of India crashed rail traffic on Thursday, halting many trains on the track while some were cancelled or diverted. A mother along with her 4-year-old son, jumped into Bhakra canal near Khalspur Bridge with the intention to commit suicide. But luckily the forest guards who were working there saw her and jumped in to the canal and rescued both of them. Here is a good news for Kharar residents and commuters frequenting the Kharar-Landran stretch, as sources confirm that ongoing widening of the road will be completed by next month. The heavy rain that lashed the region last night has hit normal life badly. It also disrupted work of Kaushlya dam. According to information available, the rain has endangered the workshop constructed for keeping of machines and the rain has demolished three-meter high check dam constructed for the filtering of the Kaushlaya dam. A major landslide opposite the HMT ESI has also endangered the existence of the Pinjore- Chandigarh NH-22. After being honoured with the Best Scientist Award during the Kisan Mela at Rakhra village, head of the genetics division at Indian Agricultural Research Institute (IARI), Dr KV Prabhu, said Punjab farmers would be given wheat seed of high-yielding HD-2967 variety before the Rabi sowings in small quantities for planting through dibbling technology. The State Consumer Disputes Redressal Commission has directed a Delhi-based company Advance Phototech to refund Rs 18,57,000 to a complainant for selling the wrong model of a photo printing machine. A 40-year-old Zirakpur-based property dealer was killed in a car-bus collision at the Sectors 45, 46, 49 and 50 traffic lights point in the wee hours of today. In another mishap, one person was injured after a truck rammed into his car in Mani Majra. An unidentified man duped a Sector 22-based jeweller of a gold chain on the pretext of checking it outside the shop in natural light on Wednesday. The jeweller, Vinod Kumar, a resident of Sector 37-A, reported to the police that the man had visited his shop, Nikita Jewellery Sector 22, earlier also. 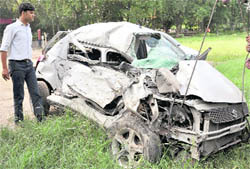 A 45-year-old woman was killed in a road accident near Pabhat road on the Ambala-Chandigarh Highway here this morning. The deceased is identified as Mitho Devi, a resident of Sukhna Colony, Ward No. 4, Bishanpura village. She is survived by her husband and three children. One person was killed during a road accident on the Dera Bassi-Barwala road last night. 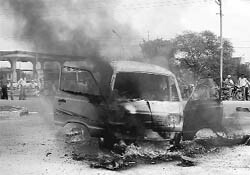 According to sources, Ashok Kumar, resident of Lalgan, Kanpur, Uttar Pradesh, was walking on a footpath on the Dera Bassi-Barwala road, when suddenly a motorcyclist hit him from behind. A 40-year-old truck driver was allegedly electrocuted at the godown area here today. The deceased has been identified as Hardev Singh, a resident of Colony No 4, Chandigarh. However, family members had suspected foul play in the death and asked to probe the matter. 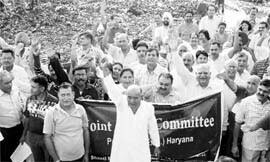 After 15 years, Roop Chand, a former sarpanch of Nagal village, has been booked under the Prevention of Corruption Act for transferring panchayat land in his name and other village members. Local shuttler Ravinder started his campaign on a winning note in the 44th Haryana State Senior Open Badminton Championship, which started at the Tau Devi Lal Stadium, Sector 3, here today. Former union sports minister and nominated chairman of Commonwealth Games sports village committee Sukhdev Singh Dhindsa slammed the main organising committee of the Commonwealth Games for dismal conditions prevailing in the sports village. The Chandigarh Golf Association (CGA) will conduct a golf clinic for all participants of the third CGA Junior Golf Tournament at the CGA Golf Range here tomorrow at 5 pm. The men squad of the forthcoming Commonwealth Games will set the city roads ablaze with their participation in the Chandigarh Administration’s ambitious cycling event, Cyclothon, which will take off on September 26. Saaniya Sharma of Chandigarh, who took a commanding seven-stroke lead over Bangalore's Sharmila Nicollet on the opening day, saw the lead margin reduced to just two strokes with the Bangalore girl firing a one under 71 card today as against Saaniya's 76 in the Hero Honda Women's Professional Golf Tour at the DLF Golf and Country Club in Gurgaon today.